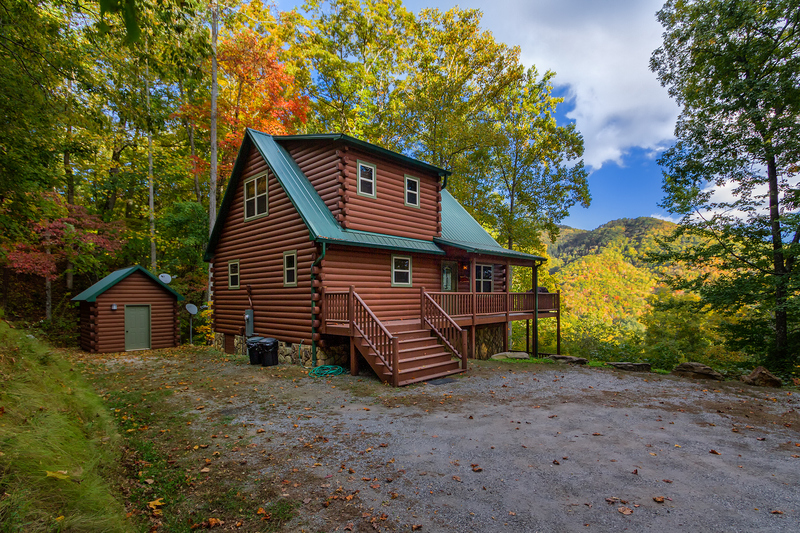 Relaxing private smoky mountain setting of this two bedroom three level log cabin. 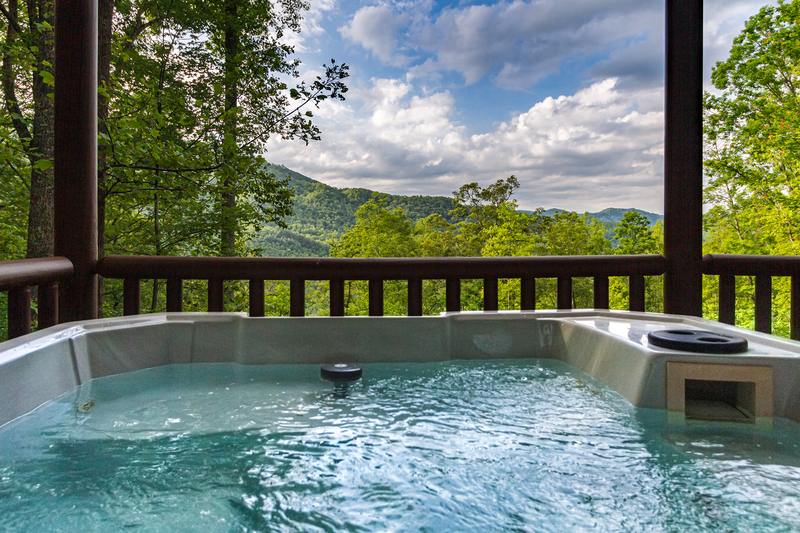 Start a romantic evening off by watching the sun set over a scenic mountain view from warm massaging waters of the hot tub on the master bedrooms private deck. 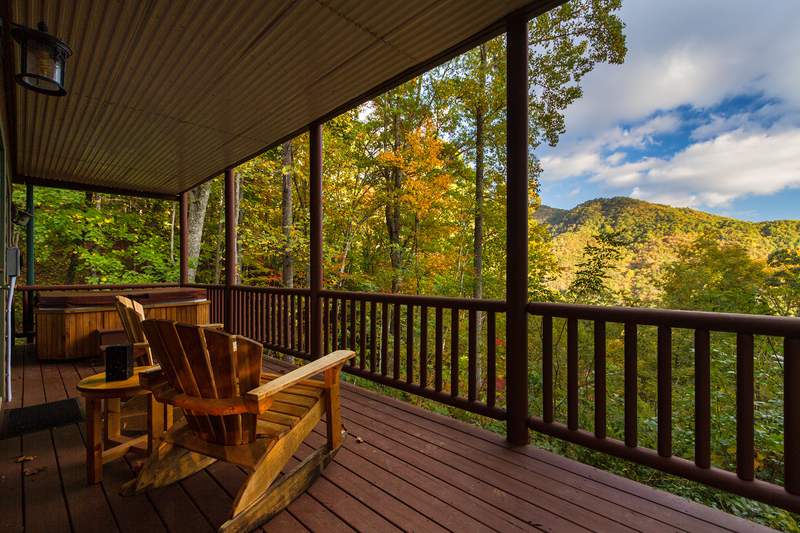 Experience how relaxing sitting in chair surrounded by the songs of native birds, rustling of leaves in a fresh cool breeze and the scenic smoky mountain view can be from the open upper deck. Fall Scenic mountain view from the deck. The glow of the fire pit warms the cool evening mountain air. Lighted steps down to the fire pit. 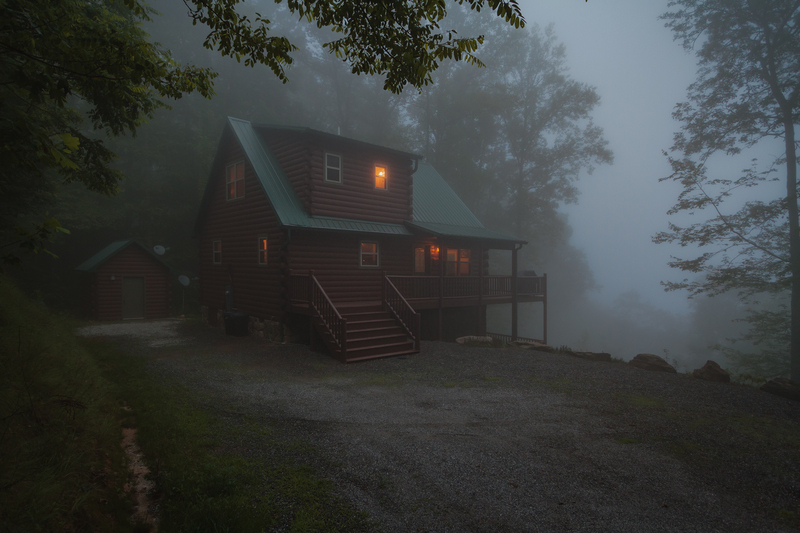 The smoky mountain mist surrounding Baines Mountain Hideaway. Baines Mountain Hideaway glowing in the evening light. Scenic mountain view from the deck. Relax in a comfortable leather sofa and watch the glow of a stone gas log fireplace or your favorite show on the flat screen satellite TV. 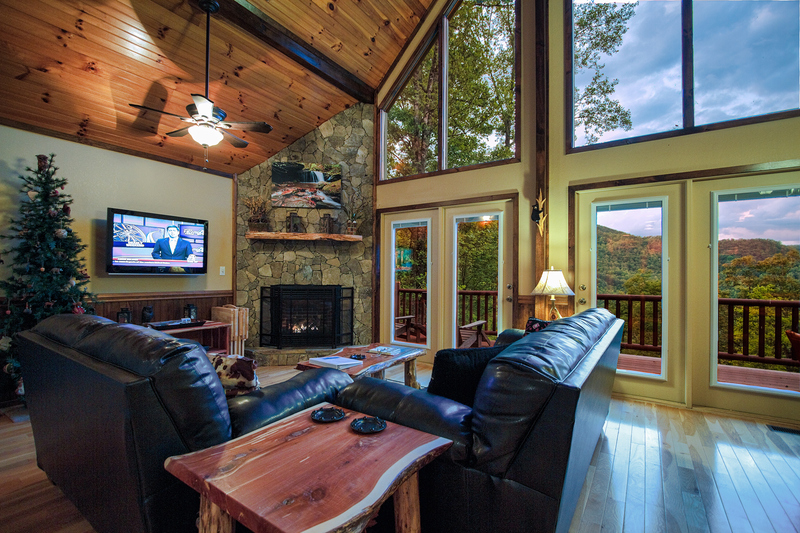 The open floor plan and cathedral ceiling high windows fill the cabin with the mountain views. 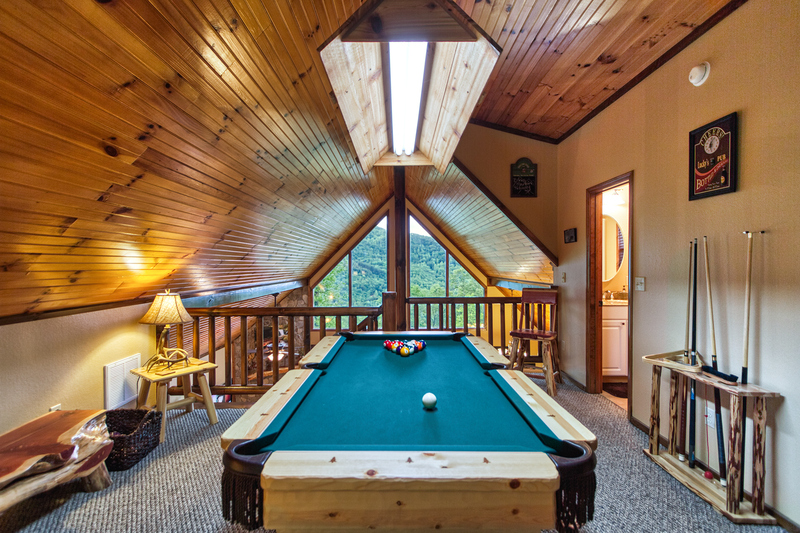 After an adventurous day of exploring the smoky mountains, spend the evening in playing a few rounds on the billiard table in the loft game room. The entire lower level is the master suite with a king size log style bed across from a warm stone fireplace and scenic mountain views. Also has a private full bath. The master bedroom has a wall of windows that let the scenic mountain view fill the room and give easy access to the covered private hot tub. The second bedroom has a queen size bed and is on the entry level. Full kitchen with stainless steel appliances including a dishwasher. All cooking and dining utensils are supplied for preparing you favorite meal. Log style dining table with a mountain view for a quiet diner in. At the end of a very scenic short back country mountain road trip you arrive at a secluded and quiet log cabin surrounded by a peaceful forest. The last part of the road and the parking area are gravel. The parking area is wide and flat allowing easy turn around for heading out to explore the area attractions. The attractions in Cherokee are about 20 minutes away. Hiking to water falls near Bryson City are about 15 minutes away. White water rafting on the Nantahala river is about 25 minutes away. As you pull into the gravel parking area, the tranquil peace of a log cabin surrounded by a natural forest set the atmosphere for a relaxing getaway. Most of the yard around the cabin is the gravel parking area, except for the side yard. A set of lighted stairs cut out of the mountain side lead from between the storage shed and cabin down to a small flat gravel area with a scenic view. Here you can experience the crackle and glow of an outdoor fire in the fresh cool mountain air. 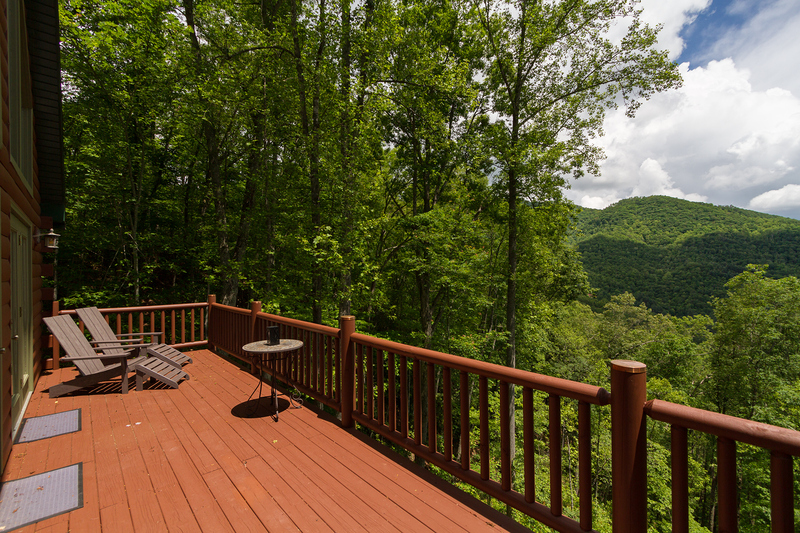 The Baines Mountain Hideaway has two decks that make up the majority of the outdoor space. A few steps up from the parking area is the main deck and the front door. 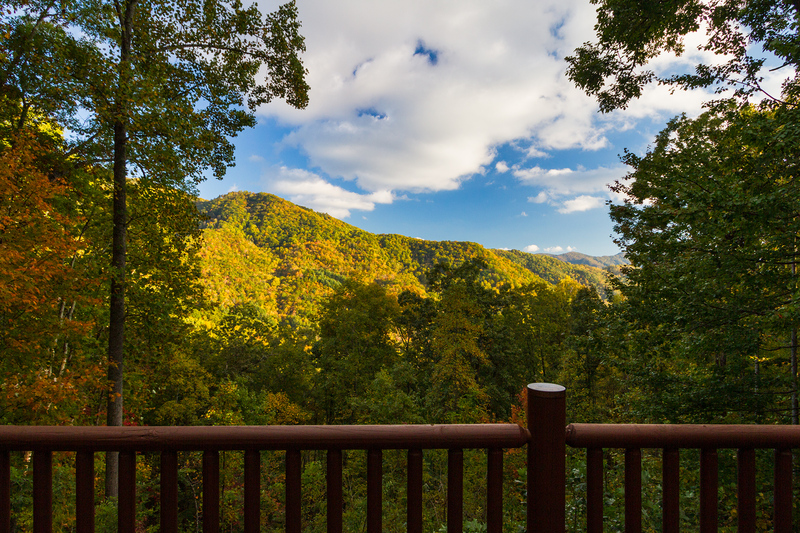 The main deck is where the scenic view is best viewed and a great place to experience how relaxing sitting a in chair surrounded by the songs of native birds, rustling of leaves in a fresh cool breeze and a scenic smoky mountain view can be. A gas grill is also on this deck. The lower deck is only accessible from the master bedroom. The lower deck is covered to provide shelter from the rain. The lower deck is an extension of the master bedrooms romantic atmosphere. Just outside the master bedroom, under the cover of the upper deck, a hot tub's warm massaging waters and a scenic mountain view await to start or to continue a romantic evening. A set chairs are also placed on the deck for watching the sunrise or just enjoying cup of coffee. Up a few steps and you are on the deck that takes you to the front door of the cabin. The warm atmosphere as you enter Baines Mountain Hideaway draws you into this beautiful space. Warm wood tones and touches of nature fill the cabin. The open floor plan includes the kitchen, dining, and living area. This is a great place for gathering a small family or few friends, or for a quite romantic getaway. The kitchen is fully stocked with all one needs for dining in. Beautiful black granite counter tops and stainless appliances accent the room. A couple of handcrafted bar stools provide extra seating near the unique log style dining table that seats 4. The mountain views fill the space through large chalet windows and french doors. The living area has comfortable leather furniture and if you can take your eyes away from the view of outdoors, you will enjoy the large stone fireplace with gas logs or getting cozy to watch your some of your favorite movies from the large selection of DVDs provided for the satellite TV. This level also provides a cushy bedroom off from the kitchen. A comfortable queen size log bed fills the space, providing a quite place to relax. Down a short hall from the kitchen is a full bath with jetted tub. A set of stairs from the living room lead up to the loft area. The open loft has a game room featuring a beautifully designed 6 foot pool table, great for friendly competitions. Lots of board games and puzzles are also provided for quite evenings in together. There is a full bath with shower on this level too.